Famous for gourmet food, fine wines, Tour de France, cognac, The French Riviera, Monaco, Paris, Mount Blanc, Eiffel Tower, romance, fromage, The Louvre and more. 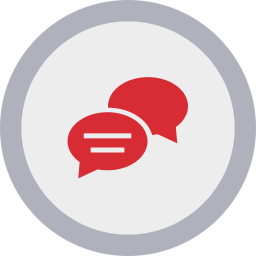 Aire de Service is an area for replenishing your motorhome’s fresh water tank and emptying your waste tank. Some also offer electricity hook ups and even toilets and showers. (Do not confuse these with the vehicle service areas to be found on the French Autoroutes – we strongly discourage you from staying on these areas, which, confusingly, are often referred to by the same name). Aires for camping cars usually provide overnight parking with limited facilities such as water and tank emptying facilities. The 'Guide Officiel Aires de Services Camping-Car'', is available online or you can buy it at service stations, bookshops or motorhome dealers throughout France. It's probably a good idea to purchase this guide before you get to France, as it usually sells out fairly early in the season. You can also look on-line for aire locations here. 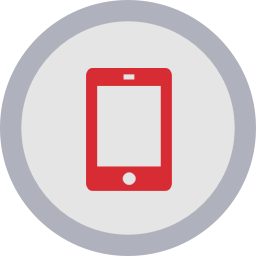 Both the book and the website are in French, but the use of symbols makes them easy to use. On the road local signs will direct you to aires but they can be difficult to find. A town plan displayed on a board in the village centre is worth a look, or the local tourist information office (identified with the international ”i ” on a blue sign) should be able to help. 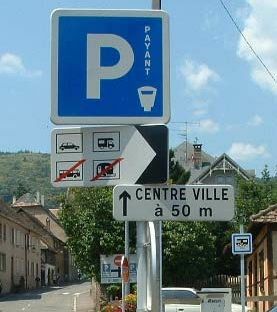 Minimalist overnight parking areas and service facilites specifically for motorhomes – or 'camping cars', as they are known in France – were invented by the French. Many local councils provide aires close to their villages to attract visitors who they hope will patronise the local shops and restaurants whilst camping overnight. Costs for an overnight stay vary depending on the facilities provided. 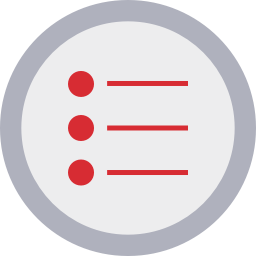 Often there is a separate charge for the parking and the facilities. For example, if you don’t need water you don’t need to pay for it’s availability. At some aires parking is free to encourage people to visit the area. Look for the easily recognised Aire de Service signs depicting a motorhome. The first picture shows that motorhomes are welcome to camp overnight here, (but not coaches or caravans). Toward the right of the picture and in the background can be seen the service area sign by the service unit. All this only 50m from the village centre! 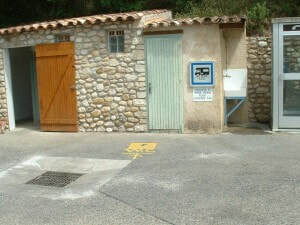 The second picture shows the tariff board and the facilities at an Aire de Service in Provence. As you can see, the overnight tariff is 6€ and there is a limit of two consecutive nights. The time limit is not generally enforced except at peak holiday times like August. At this aire a warden collects the money each evening and issues a ticket to confirm payment. The facilities at this site are shown in this picture and are included in the €6 fee. The open door on the left leads to the toilet and shower and the drive-over dump grate for grey water is visible at the bottom left of the picture. A separate, toilet waste drain can be seen in the ground, covered by a removable yellow painted lid. Fresh water is available from a tap by the washing-up sink on the right hand wall of the toilet block. 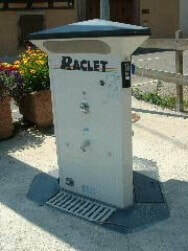 This particular aire charges an inclusive fee and the facilities are then freely availabe to anyone there. However it’s common for a proprietery services unit to be installed on the aire. These automate the aire and obviate the need for a warden to collect fees. 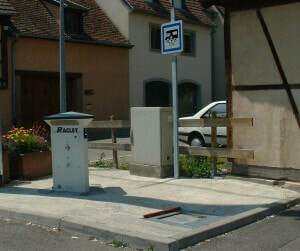 This arrangement is probably the most common in France. You pay for the parking and the facilities separately. There may be a parking meter which takes your money and gives you a ticket to display in your windscreen, unless overnight parking is free. As well as this aire there’ll be a 'Sani-Station', 'Flot-Bleu', 'Euro-Relais' or similar services supply post. 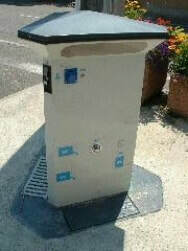 For example, the 'Sani-Station' is coin operated and the services are controlled by a timer. More details of how this particular type functions, along with some pictures can be found on the German Stellpatz page. The following pictures show a 'Euro-Relais Junior'. Services supply post and the drive-over grate for grey water. Ground level flap which opens to allow a chemical (cassette) toilet to be emptied and at the top left of the unit is the blue electricity outlet. Fresh water supply is located at the side. 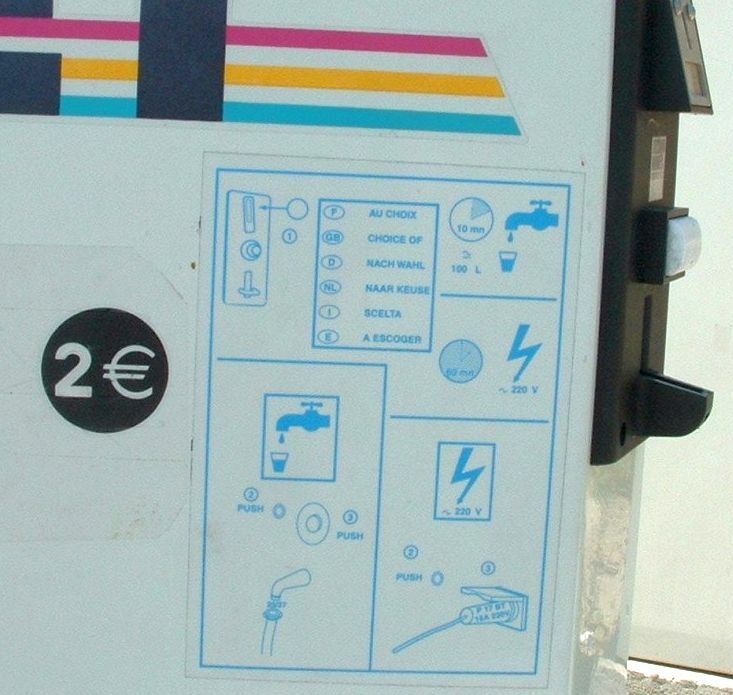 The instruction panel and charges: 2€ for ten minutes or 100 litres of fresh water, and 2€ for 60 minutes of electricity. No mention is made of paying for grey water disposal so it’s probably free. France Passion is a scheme run by private individuals – usually farmers or vineyard owners – who will let you park overnight at their property without charge in the hope that you might buy something from their farm shop or winery. There is an annual fee to be a member of the scheme and this works out at approximately NZ$50. 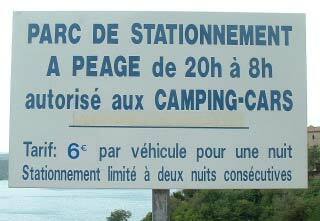 There is lots of camp site information on the France Motorhome and Caravanning Guide website. 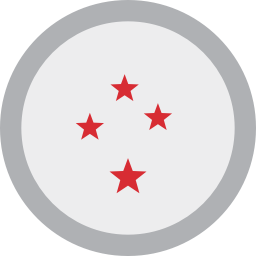 (Click the flag on the website for English translation).